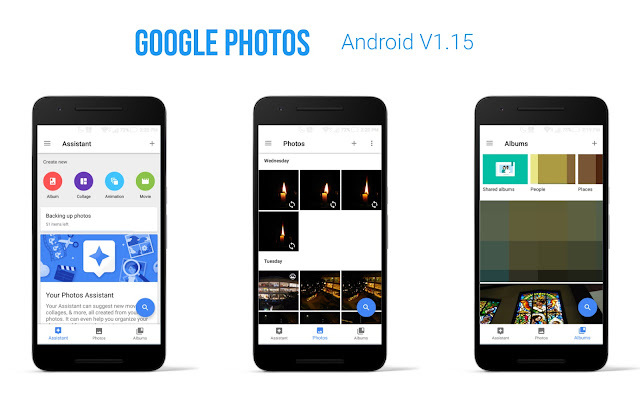 Google Photos v1.15 for Android has gotten a (somewhat unexpected) UI update. Gone are the swipe gestures that you could use when switching between views, and in its place is a white bottom bar: yes, you read that right – the feature on the Google+ app that’s been receiving lots of controversy from the outset – has made its way to Photos. Here, you can move between Assistant, Photos and Albums view – formerly Collections. As mentioned above, another thing you’ll notice – once you get over that bottom bar 😉 – is the renaming of Collections toAlbums. I guess they did this to avoid confusion with G+ Collections, which kinda makes sense. The Albums view now has a scrolling carousel at the top, where you can find your Shared Albums, People, Places, Things, Videos, Collages, Animations, Movies, and Device Folders. Personally, I miss swiping in the old Photos app as navigating between the different views just seemed so effortless. Now, however, tapping the three buttons at the bottom is pretty difficult, to say the least. I have a 5-inch Zenfone 2 Laser, so I don’t have much trouble stretching my thumb to the edge of the screen, but it would be incredibly hard for those using this on tablets. Looking at this from a wider perspective, could this mean we’ll see the controversial bottom bar appear on other Google apps as well? Here’s hoping the Photos team would give us the best of both worlds: leave the bottom bar, but also return the swiping gestures from one view to another. For those on iOS, sit tight – these features will be heading your way in a future update.